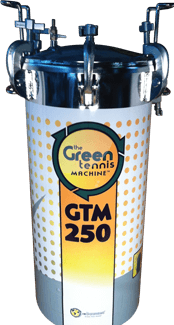 The GTM 250 can re-pressurize 250 balls every 72 hours (that’s 500 balls per week or 7 cases, over 25,000 balls per year!). Utilizing our revolutionary reBounces technology, you can now restore dead balls back to their original bounce. The Green Tennis Machine extends the life of your practice balls and reduces waste that goes to landfills. On average our clients save over 50% on their practice ball budgets and are finding that they can cut back on purchasing enough new tennis balls to more than pay for their Green Tennis Machines. And with our various financing options, they are not having to make a capital investment in a tennis ball charger. The Green Tennis Machine is the most significant product to hit the tennis world in years. As academy owners we see the substantial financial commitment we make to keep quality tennis balls in our teaching carts. The Green Tennis Machine ensures that every ball we feed bounces, and the savings we gain from having multiple cycles with our balls has been tremendous. It is good for the sport and good for the planet, and that’s a winning combination! The Green Tennis Machine has already paid for itself by allowing us to cancel over half of our ball order for the year. It has also become an additional revenue source, allowing us to sell repressurized balls and rent out the use of the machine to other programs and tennis professionals. It has been great for our bottom line and it is great for the environment! This machine is a game changer for the tennis industry.